It was a cool overcast fall afternoon in New York City. 55,052 carzed Mets fans filled Shea Stadium, as the NLCS returned to Queens for the first time in 13 years. There was plenty of excitement surrounding this one even before it began. The Series was tied at one game each, after a split in Houston. Mets manager; Davey Johnson sent Ron Darling (15-6 / 2.81 ERA 184 Ks) to the mound to face Houston’s Bob Knepper (17-12 / 3.14 ERA / 145 Ks). Ron Darling was shaky in the 1st inning, giving up three hits, a wild pitch, a hit batsman and two RBI singles. Bill Hatcher got the first hit & stole second base. He scored on Wallings base hit. With Glen Davis up, Darling threw a wild pitch & then hit Davis. He struck out Kevin Bass but gave up a single to Jose Cruz. It got worse for him in the 2nd inning, as Bill Doran hit a two run HR making it 4-0 Astros. Houston's Bob Knepper rolled along, fustrating the Mets hitters. He allowed no runs on just two hits into the 6th inning. The Mets fans were quiet just waiting for some thing to happen. To lead off the home 6th, Kevin Mitchell & Keith Hernandez both singled. Next up, Gary Carter reached on a Bill Doran error as Mitchell scored the Mets first run, 4-1 Astros. The crowd began to get excited & a classic Mets moment followed. Daryl Strawberry delivered with a dramatic high flying three run HR into the right field lodge section that tied the game at four. The shot fired up the Mets team, as Keith Hernandez gave a hard friendly shove to both Ray Knight as well as Strawberry at home plate as Straw touched the plate. The Shea crowd went into a wild frenzy. In the top of the 7th, Rick Aguilera came in relief and gave up a walk to Bill Doran. Then Billy Hatcher bunted to third base & a Ray Knight error put runners on the corners. Denny Walling then grounded out but scored Doran putting Houston ahead 5-4. In the bottom of the 7th inning, Lenny Dykstra pinch hit for Rick Aguilera & struck out. He would later play an important role in the game. In the 8th inning, Astros reliever; Charlie Kerfeld retired the Mets in order, setting up a save opportunity for Dave Smith. In the bottom of the 9th, Wally Backman led off with a bunt base hit down the first baseline. As he slid into first base, the crowd went wild & got loud. Astro Manager; Hal Lanier argued Backman slid out of baseline to avoid tag. Home plate Umpire Frank Pulli dismissed Lanier calling Backman safe. Next, Dave Smith threw a pitch passed catcher; Alan Ashby and Backman advanced to second base. Pinch hitter Danny Heep stepped in but flew out to center for the first out. 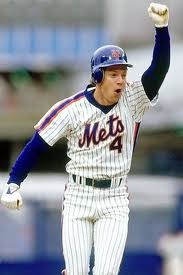 Now Lenny Dykstra came to bat as Mets legendary broadcaster said "the man they call Nails" stepped in. Murphy continued with an excited calssiccall- "It's a high fly ball hit to right field, its fairly deep its way back, its by the wall .... its a HR a HR, the Mets win the ball game. Dykstra hits a HR"
Yes, Dykstra blasted Smith's pitch down into the right field bullpen, ending the game in dramatic walk off fashion. 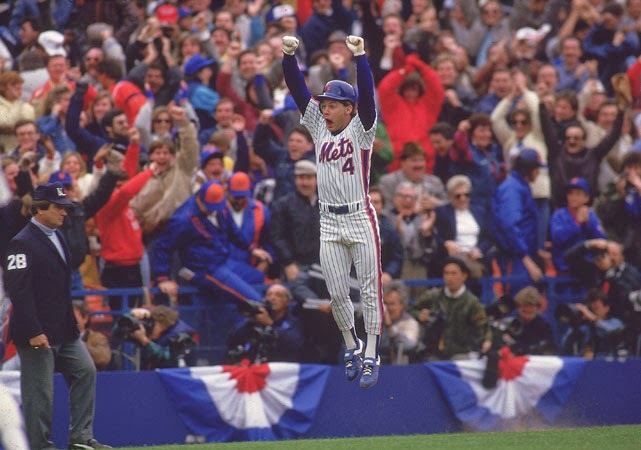 Shea Stadium went wild, as did the Mets team mates who went to home plate to greet Dykstra. 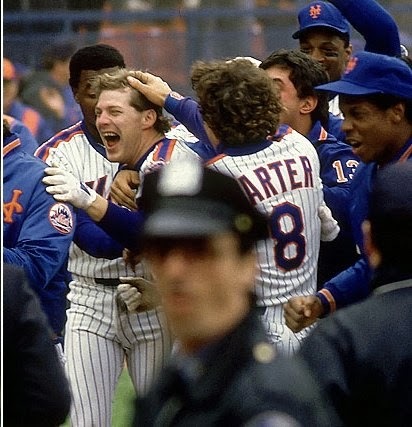 Quotes: "Lenny Dykstra being mobbed by his team mates"- Bob Murphy. 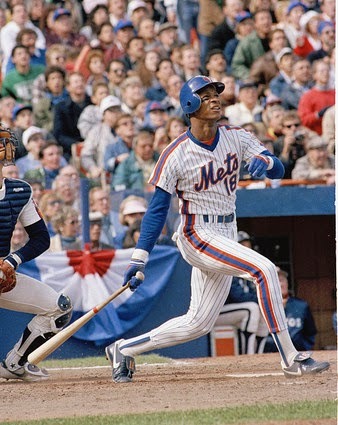 Nails had hit, what became one of the most famous HR’s in Mets history, putting New York up two games to one in the NLCS.